Long popular with Asian tourists, Saipan is the fastest-growing island in Micronesia, with golf courses, holiday resorts and duty-free shopping taking center stage as vacation attractions. But it operates largely under the radar when it comes to American travelers -- which is ironic because it's the capital of the U.S. Commonwealth of the Northern Mariana Islands. This tropical bump in the Pacific Ocean -- just 13 miles long and five miles wide -- is self-governing, but its citizens hold U.S. passports, and they trade in U.S. dollars. Saipan has a total population of about 70,000 people -- dominated today by Chinese, Filipinos and Japanese. What does this mystery paradise look like? First, Saipan has virtually no tree line because the island was heavily bombed during World War II. Garapan, the largest town, was leveled during the war. Since the 1960's, it's been redeveloped and today houses shops, restaurants and ubiquitous 24-hour poker parlors. Saipan, the largest of 15 islands in the Northern Marianas, is thought to have some of the best beaches in Micronesia, many protected by coral barrier reefs. 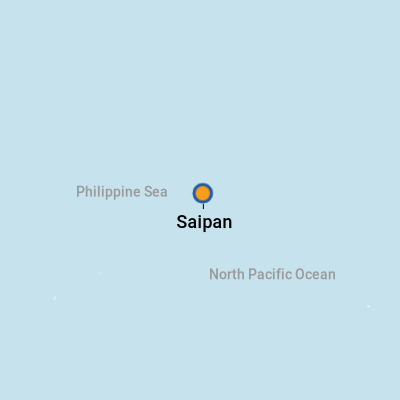 Saipan is also known as the site of the Mariana Trench, the deepest point in the earth's oceans at 38,635 feet. But take note: While the natural wonders of the island can be compelling -- especially the aquamarine waters -- the communities, including Garapan, are a bit downtrodden. Saipan is probably best known to Westerners for its role in World War II. Victory in the Pacific hung on the outcome of the battle for the Marianas, and it was in Saipan that the decisive battle of the Pacific offensive took place. After days of bombing, shelling and strafing the island, U.S. forces landed on June 15, 1944 and fought for three tough weeks to wrest Saipan from the Japanese. More than 28,000 Japanese soldiers perished in the battle, while nearly 3,500 Americans were lost. At Banzai Cliff, many Japanese jumped to their deaths, rather than facing capture, following the final orders of Lt. Gen. Yoshitsugo Saito, who said, "Whether we attack or whether we stay where we ar...As it says in Senjinkun (Battle Ethics), I will never suffer the disgrace of being taken alive." Allied soldiers would later call Banzai Cliff "Hara Kiri Gulch." Maj. Robert Sheeks -- who witnessed hundreds of people, including families, committing suicide -- later wrote, "There was death all around the place...You really think the world is coming to an end." Memories of World War II are still close to the surface in Saipan, and today they form a remarkable record of a remarkable time. Ships dock at a commercial pier that is tightly regulated by security personnel. There are no tourist facilities whatsoever at the port. There's nothing there to hang around for. So-called "local" handicrafts include carvings and woven wall hangings, but buyer beware. While they may have a"“Made in Saipan" sticker on them, they are actually manufactured in the Philippines. On top of that, they're pricey. A few metered taxis call on the port, and cruise ships often run complimentary shuttles into Garapan, the island's primary commercial area. It's about a 30-minute walk to the main shopping district and gorgeous Micro Beach. It's easy to drive the island's U.S.-quality roads, and you can pretty much make a loop of the entire island in a half-hour. There are plenty of car rental agencies, including Hertz, Dollar, Avis and Budget. Editor's tip: If you do rent a car, be sure to take along a map that highlights the sites of the Battle for Saipan. There are also signs at the sites themselves. The local currency is the U.S. dollar. If you're running short, there are numerous banks, such as Bank of Hawaii and Bank of Guam. ATM machines are also plentiful. Officially, it's English, along with the language of the two indigenous peoples -- the Chamorro and the Carolinian. Not surprisingly, given the population, a number of Asian languages are spoken as well. Garapan is easy on the palate, no matter your preference. For an island specialty, ask for the chicken kelaguen, barbecued chicken breast tha's chopped and served with freshly grated coconut, onion leaves and hot peppers. 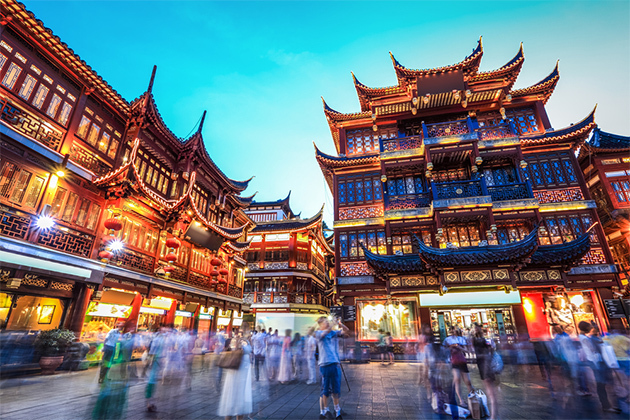 In the tourist district, you'll find Chinese, Korean, Thai and Japanese restaurants. One of them, Ubu Restaurant, offers free wireless Internet access. 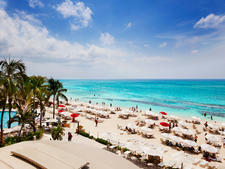 The top hotels, namely Hyatt Regency and Pacific Islands Club, tend to house the better restaurants. The Hyatt, for example, specializes in Italian, Japanese and Chinese cuisine. More interested in a fix that reminds you of home? Then look no further than the golden arches. Yes -- they're here. For an authentic remembrance of this history-making island, check out the shop at American Memorial Park, which has a wide selection of books, DVD's and logo-type shirts and hats. Serious shoppers may think they've entered paradise. DFS (as in duty-free shopping) Galleria, on Beach Road in Garapan, offers top name brands and fashions, including Prada, Chanel and Gucci. Prices are high but are cheaper than you'll find in Japan.